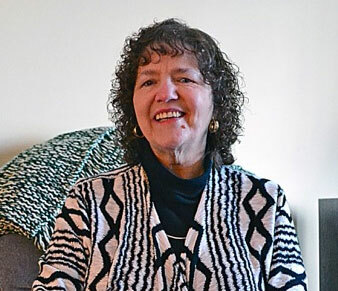 Patty Sarchi was born in 1947, and grew up in Van Buren, in Maine’s St. John Valley, on the Maine-Canada border. Her grandparents and parents both spoke Acadian French. She has been a prominent member of the American Council of the Blind. SARCHI: …And I would go over to the park and walk in the dry leaves in the Fall. That was different. Listening to the birds in the Spring. I hadn’t heard them. You can’t lip read birds. Sorry. SARCHI: There were no assistive devices then, and hearing aids were available, but I didn’t want to wear one. And fortunately my parents were smart enough to not buy me one and force me to wear it, because it would have–somehow I think it would have made me a different person. NARR: She got by until she was a freshman in high school. NARR: And that opened up an entirely different world of sound, some as ordinary as when her father would stir his coffee with a spoon. NARR: As a young mother, Sarchi began experiencing a second disability. She began to lose her sight when she was twenty-seven and had three small children. SARCHI: It’s hard to tell them that you don’t see well, because they can’t imagine that at a young age, and at the time I was doing quite well. I was still driving. So they didn’t pay too much attention to it. They knew I couldn’t hear well, and when I was alone at night, they were more or less in charge. And my oldest son, who matured at a young age, took charge of letting me know when the babies were crying or needed to be changed. He was a good little babysitter for his brothers and sisters. NARR: But when her husband was a way for a few weeks, it required a creative solution. SARCHI: I figured, “What am I going to do? I won’t hear her if she’s crying in the night.” So I took the port-a-crib, and I set it up at the foot of my bed, and I tied a string around her ankle, and the other end around my wrist. And that’s how we slept, because when a baby cries or frets during the night, they move, and their little feet and legs are always going. So that would pull on the string, and that would wake me. SARCHI: People didn’t really understand disability, so they didn’t allow the disabled child to be publicized. They were not going to be shown to the world that they had a disability. And oftentimes the children never knew the outside world. I’ve known of a couple of women who were blind and lived in a small community in the typical little white house with the white picket fence, and the gate, and that’s all they’d ever seen all their lives. Well, their parents died, and where did these people go? They were more or less forced to go into institutions. NARR: She says the vocabulary and ownership of words like, “blind,” are still difficult for some people, but the ADA has changed the hiding syndrome. The disability rights movement also changed the perspective of persons with disabilities. SARCHI: I think we all did what we could to make it work. And I think that’s when many of us just stopped feeling disabled; stopped feeling different, and, Hey, we’re one of everybody. We’re all the same. We all do things differently because of the way we were raised, or because of our ethnic group, or because of the equipment we have, or because of who we are. NARR: Sarchi says there is more work to be done with regard to transportation, employment, and accessibility of buildings. She would especially like to see more access to support service providers, who provide assistance with routine daily tasks and act as liaisons with the word at large. But without the ADA, life would have been much more difficult. SARCHI: Yes, it would have been a lot more difficult to get on airplanes, on busses, in restaurants, in hotels. All of these would have been next to impossible without the ADA. NARR: I’m Keith Ludden. Our series on the twenty-fifth anniversary of the Americans With Disabilities Act is funded in part by the Maine Humanities Council, in partnership with the Maine Arts Commission, Oral History and Folklife Research, Alpha One Independent Living Center, WMPG, and the Disability Rights Center of Maine.